Zhongli Quan (鐘離權 or 鐘离權) (Wade-Giles: Chung-li Ch'üan) is one of the most ancient of the Eight Daoist Immortals, having allegedly lived during the Han Dynasty (206 B.C.E. - 220 C.E.). Initially a well-respected general in the Han emperor's army, he became renowned later in life as an alchemist, and as the instructor of Lu Dongbin (a fellow immortal). Today Zhongli Quan is remembered for his dedication to helping others, and for cultivating his own spiritual and moral character. He is said to have saved the lives of a number of starving peasants by creating (through alchemy) enough silver to allow them all to purchase food for themselves. In Chinese art, Zhongli Quan is typically portrayed as a rotund man bearing a feathered fan or a peach. Zhongli Quan is one of the illustrious Eight Immortals (Ba Xian), a group of Daoist/folk deities who play an important role in Chinese religion and culture. While they are famed for espousing and teaching Daoist philosophy and cultivation practices, they are also figures of popular myth and legend that are known for their devotion to the downtrodden and their collective lifestyle of “free and easy wandering.” Though they are most often depicted and described in the context of their group, each has their own particular set of tales, iconography, and areas of patronage. Each of these three elements will be elaborated on below. From birth, Zhongli was destined for a life of spiritual attainment, as he was born with all of the physiognomic signs of a deity or immortal, including "a round pate, broad forehead, thick ears, long eye-brows, deep eyes, red nose, square mouth, high cheeks and scarlet lips." Further (and more significantly), he spoke after only seven days in the world, informing his parents, "My feet have wandered in the purple palace of the [immortals], my name is recorded in the capital of the Jade Emperor." Despite these early indicators of spiritual potentiality, Zhongli followed his father's example and became a member of the Han Dynasty’s court. Appreciating the young man's intelligence and bearing, the emperor promptly appointed him as the general of one of his armies and assigned him the task of protecting the country's borders from foreign incursion. During one of these campaigns, the Zhongli’s forces were completely routed and he was forced to flee. Following his abrupt retreat, Zhongli found himself lost and alone in a frozen mountain valley, certain that his own death was imminent. To his surprise, he suddenly came across a sagacious old man, who gave him directions to the home of a local spiritual adept. Upon his arrival, the house's occupant called the young general by name and offered him sanctuary. Realizing the spiritual potency of his host (and the futility of his previous worldly aspirations), Zhongli beseeched the old man to instruct him in the ways of the Immortals. The elder agreed, and the two men embarked on an intensive exploration of alchemy, Daoist philosophy and magical practices. After three exhausting days, the adept dismissed Zhongli and instructed him to use these powers in the service of people. As the former general walked away, he realized that he had not properly thanked his benefactor, but, when he returned to the old man's haven, only an empty field remained. From this point onward, Zhongli became entirely dedicated to the quests for spiritual betterment and moral perfection. In one celebrated account, he single-handedly saved the lives of a number of peasants by creating (through alchemy) enough silver to allow them all to purchase food for themselves. At the same time, his search for the secrets of immortality eventually led him an elaborate alchemical recipe, which, when followed, allowed him to finally escape the bonds of the world and to ascend to the heavens. Despite the fame he achieve for his participation in the events described above, Zhongli is best known for his role in the eventual enlightenment of Lu Dongbin. In the visual arts, Zhongli is "represented as a bearded, corpulent, bare-bellied old man of pleasant disposition," who is bearing a peach of immortality or a feathered fan (thought to have power over the seas or over the forces of life and death). Often, he is also pictured with the stork that heralded his final ascent to the ranks of the immortals. Zhongli is the patron of military soldiers. 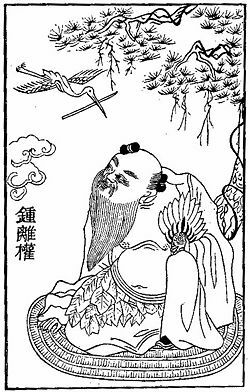 He is also remembered for his alchemical skills, he is seen as a profound teacher of inner and outer alchemy, whose teachings are recorded in a book entitled The Transmission of the Dao to Lu Dongbin. ↑ Note: In some versions of this tale, Li Tieguai (who had evidently attained immortality previously) saw Zhongli in his military regalia and realized that any further success in mortal endeavors might cause him to become too encumbered with worldly success to ever attain immortality. To combat this, Li snuck into the enemy encampment and informed the general of Zhongli's plans and troop placements. With this knowledge, the rout of the Han general's troops became inevitable. See Ling (63) for more on this particular version. ↑ In some accounts, this man is described in the dress of a shaman (Wong, 17), and in others, he appears as a monk (Ling, 63). ↑ Wong, 16-18; Ling, 62-64; Werner, 344-345; Yetts, 776-781. ↑ Ho and O'Brien, 28; Goodrich, 315; Werner, 345. Ling, Peter C. "The Eight Immortals of the Taoist Religion." Journal of the North China Branch of the Royal Asiatic Society XLIX (1918). 58-75. Wong, Eva. Tales of the Taoist Immortals. Boston & London: Shambala, 2001. ISBN 1-57062-809-2. Yetts, W. Perceval. "The Eight Immortals." Journal of the Royal Asiatic Society of Britain and Ireland for 1916 (1916). 773-806. Available online. This page was last modified on 4 April 2008, at 02:41.